By Warren Shiver — I have the pleasure of working with two IronMan triathletes (Monique – the sponsor of this site and blog, and David Szen, who recently guest posted). It’s been amazing to watch and consider Monique’s dedication and commitment to training as she and Greg train for Lake Placid this month. As an outsider (while I exercise 4-5 times per week, I am much, much closer to having a 0.0 bumper sticker than 140.6) and admit not much desire or motivation to go beyond sprints, which of course if barely a warm-up for many of you reading this post. That said, it’s been fascinating to become a little more glued in to the tri scene and observe some of the motivators for both the casual and the fully committed athletes. Health – given the well-documented obesity and health issues in our country, the uptick of participation in triathlons is certainly welcome news – although it’s a small dent in the overall population. Seems like many late (or middle aged) arrivals to the sport like myself are looking to change up their workouts and ether work off the expanding waistline and challenge themselves as metabolism starts to slow. Gear – I have some friends who are true “gear guys/gals” and while they are strong athletes, seems like a large part of the motivation is the cool (and pricey) gear and equipment that they are able to buy/justify. Camaraderie – As my friend and I were standing around on the beach waiting for our wave to be called up to hit the water, I turned to him and said, “did you notice out of 300 guys, we are almost the only two with body hair”? Good times. Drive – training for any tri, but certainly the longer distances takes incredible drive, determination, and dedication. Not surprisingly, I read an article that stated that the average IronMan race finisher has an income in the low six figures – well above the national average. While compensation is only one indicator of success – it’s intuitive that individuals with these qualities will be successful in their other pursuits as well. Hats off to all of you competing this month and/or training for upcoming events – at any distance. Would love to hear about your personal motivation – especially as most of you have many demands on your time, especially children. Warren Shiver is the founder and managing partner of Symmetrics Group, a sales consulting and effectiveness firm. 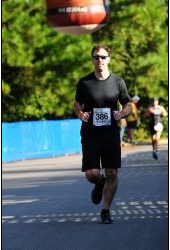 While he has exercised regularly for more than 20 years, he completed his first sprint triathlon in 2013, and has another scheduled in September, 2014. He lives in Atlanta, GA with his wife and two teenage daughters. You can contact Warren at warren.shiver@gmail.com.